Leading yarns, knitwear and knitted fabrics trade fair SPINEXPO has announced changes in dates for its 25th Shanghai edition. Spring/Summer 2016 trends and products will be on display at the exhibition that will now take place from 9-11 March 2015 at the Shanghai World Expo Exhibition & Convention Center. SPINEXPO, which has become an international meeting place for ready-to-wear brand manufacturers with collections of flat-bed and circular knits, wovens, hosiery and new warp seamless knits, will feature fibres and yarns for knitwear, weaving and hosiery, as well as knitwear collections from the leading international knitwear manufacturers. 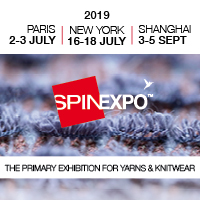 Organised by independent textile specialists, SPINEXPO takes place twice a year in Shanghai and once a year in New York. It also features seminars and covers creative machinery for knitwear and circular knits.